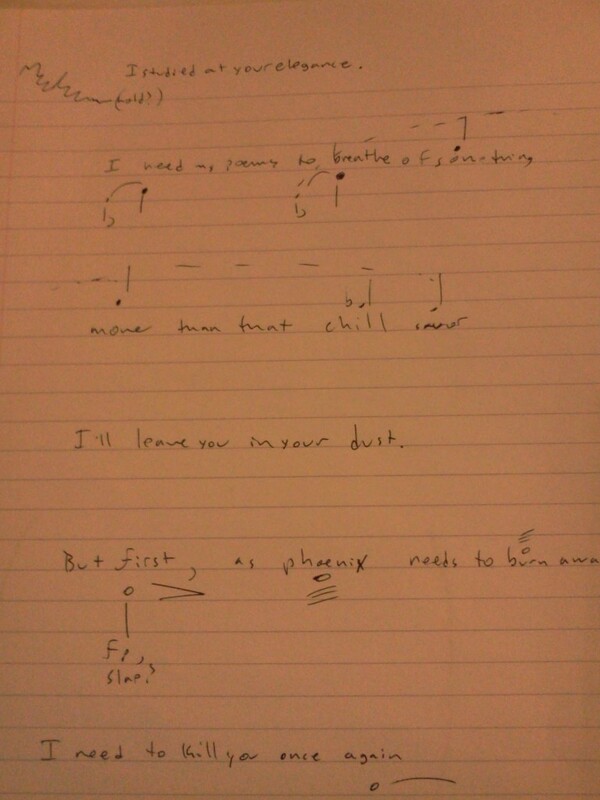 Here’s my first sketch with actual noteheads in it for Poems Without Names. I can’t believe that this piece is going to be done and performed on St. Patrick’s day. I’m using a lot of the same techniques from The Seafarer and from The Lovesong of J. Alfred Prufrock, but instead of a solo performer, I’ve got a poem with a duet. This is a lot like what my sketches looked like for Seafarer, too, if I remember right. The lines of poetry were there, with the possibility of rhythmic stretching from an actor, and there were noteheads above and below the syllables, giving a contour segment at least, and giving a rough idea of the rhythm I wanted, as well as some notions of timbre, etc. Sometimes I mark intervals, usually I don’t. I don’t know if other people write like this, but then again I don’t know if other people are as obsessed with wrapping the music around the full freedom of an actor’s delivery. If there are other ways to do this kind of mapping, I’d love to see them. For now, though, back to sketching. If I start to feel comfortable enough with my cut of the poem, maybe I’ll post that too soon.